Every coyote hunt you experience isn’t like those you watch online or on the big screen. I’m reminded of that every time I go out coyote hunting. Rarely do I have coyotes barrel in with white flags waving for surrender. On a recent hunt where I teamed up with Hornady’s Neal Emery on a hunt hosted by Kody, Jordan and Kelly Glause at Heart Spear Outfitters in central Wyoming. Kelly, the elder statesman of the group, spent part of his career as a professional coyote getter and knew the area well, plus local coyote behavior. Coyote breeding changed the game a bit, but the howling, winter winds of Wyoming wreaked havoc on the hunt as we soon discovered. Regardless, when you set aside days to hunt, you simply hunt. The winds held off the first morning and coyotes answered Kelly’s vocalizations, but we still didn’t strike the right chord to lure one into rifle range. Howls, tracks and droppings all told a tale of numerous coyotes calling the area home and as we hiked to our third set of the day we finally met a local inhabitant. Peeking over a ridge, Neal, Kelly and I all commented on the eagles and magpies congregating below. There had to be something dead there and a coyote bounding off in the distance confirmed the Grim Reaper had made a visit. Neal dropped to use his sticks and he was armed with a custom rifle chambered for the new 6.5 PRC. Kelly and I verified the distance simultaneously, but just as Neal dialed in for the shot the coyote disappeared behind a ridge. Our discussion at just what occurred was cut short by the appearance of a second, closer coyote. “250 yards,” I whispered as Neal settled the reticle and a second later he laid the coyote flat. As we headed over to recover the fur prize we discovered what had been drawing the scavenger crowd. A young mule deer buck had become tangled in a barbed wire fence. It met a gruesome death as it likely was alive while the coyotes started dining. The winds kicked up soon after and our calls were practically useless the remainder of the trip. Nevertheless, Neal bagged another coyote simply while roaming between callings sites and another person in a separate party missed a coyote also while hiking to a setup site. So what was the lesson learned? If you can’t call them and the terrain allows, roam a bit. In high-density coyote country you might be able to jump a coyote for a shot or spot, and stalk. If this intrigues you here are some tips to increase your chance at roaming success. First, move slowly, especially as you reach a high point. Before walking over the top of any hill you should slowly peek and scan. Coyotes have great eyesight, but slow movement and a low profile is hard for them to detect. 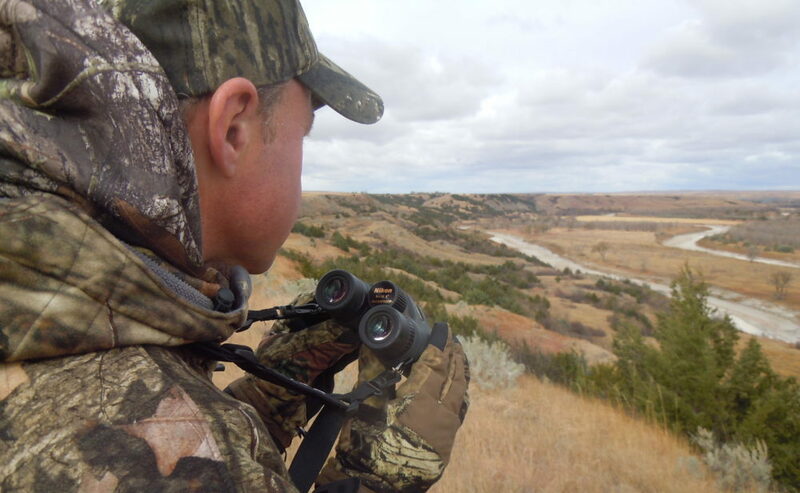 Of course having a quality binocular is essential in determining if the light-colored spots you see in the distance are coyotes or brush piles. In open country you may want to use a 10-power model, but an 8-power model can handle most situations. One thing that speeded up Neal’s shooting was my use of the Nikon LaserForce 10x42 rangefinder binocular. At the same time I was identifying the target I was also able to feed ranges to Neal without switching gear. Lastly, consider a caliber that can “reach out and touch somebody.” Your shots could be longer and a high BC bullet helps keep an accurate trajectory over a long range. You get that in new calibers like the 6mm Creedmoor or its big brother the 6.5 PRC. Pack lightly and tweak your clothing to the conditions. Quality hiking boots, poly-based clothing and layers to add or subtract as you heat up all should be considered. When the coyotes don’t respond to calls or the conditions won’t allow calling, consider roaming for your next fur prize.